Hope Services Hawaii workers pick up backpacks from Officer Jason Grouns, Chief Harry Kubojiri and Officer Patrick Menino at the Hilo police station, one of eight collection sites around the island. Kama'aina Motors employees display a truckload of backpacks their company collected after payroll clerk Ashley McCollum-Ranne (at far left) heard an announcement on the radio. Seen in this file photo at age 14, From Kids For Kids founder Nani Welch-Keliihoomalu displays backpacks collected for children in need. 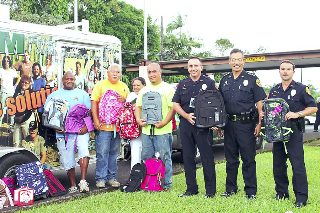 The Hawaiʻi Police Department is pleased to announce that families throughout the island donated more than 300 backpacks for children in need during a backpack drive between July and September. 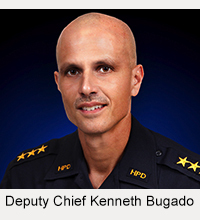 During the backpack drive, all police stations around the island doubled as drop-off points. 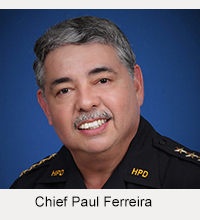 This was the fifth consecutive year the Police Department has worked in partnership with HOPE Services Hawaiʻi (formerly known as the Office of Social Ministry) and From Kids For Kids in the collection and distribution of these items. In addition to the backpacks, thoughtful citizens donated numerous boxes worth of school supplies. Hope Services Hawaiʻi provides a continuum of homeless and transitional programs from outreach to emergency shelters, including permanent supportive housing placements. From Kids For Kids was founded in 2006 by Big Island resident Nani Welch-Keliihoomalu, then 10, who was responsible for distributing backpacks containing books, clothing, art and school supplies. Now 17, Welch-Keliihoomalu raised an additional $450 in cash donations for the project this year through her school, Hawaiʻi Preparatory Academy. Another $250 was donated by the Ikitagawa company, parent company to Kamaʻaina Motors, Napa Auto Parts, Kamaʻaina Nissan and Kona Auto Center. 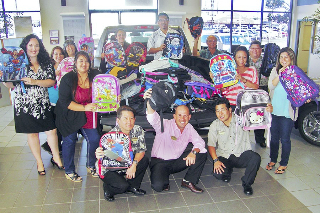 Iktagawa also collected 132 backpacks and several bags of school supplies after Ashley McCollum-Ranne, a payroll clerk at Kamaʻaina Motors, heard an announcement on the radio and approached General Manager Ivan Nakano about collecting backpacks from employees. Other large contributors were HFS Federal Credit Union, which donated 75 backpacks, and Immaculate Heart of Mary Catholic Church in Papaʻikou, which donated 12 backpacks. Backpacks have been identified as the most requested non-food item for charities in Hawaiʻi. The donated backpacks are being distributed to women’s shelters, homeless shelters and transitional housing around the Big Island.